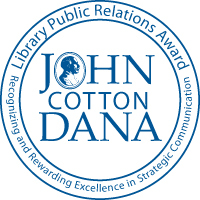 The Gail Borden Public Library has been honored with the prestigious 2008 John Cotton Dana Award from the American Library Association (ALA) due to community involvement. The award committee commended the library in "making exemplary use of partnerships, the library leveraged the exhibit to rocket its way to record numbers for summer reading participation, as well as library card registration, materials circulation, program attendance, culminating with a live chat with an astronaut aboard the International Space Station." To view the SPACE: Dare to Dream photo gallery, click here.